“We have officially canceled the recession in South Pasadena for the weekend,” smiles one event organizer. The 12th Annual Mission West Spring Art Festival promises to be a one-stop, boutique-type outdoor mall adventure that offers browsing and buying advantages to save money in this tight economy and the best way to help stimulate the arts community. Raytheon Company today awarded a Math Hero Award to South Pasadena Middle School’s Doug Buhler for his efforts in engaging students in math through interactive and creative learning programs. Selected from a field of 160 nominations, Buhler will receive a $2,500 award and a matching grant of $2,500 for South Pasadena Middle School. 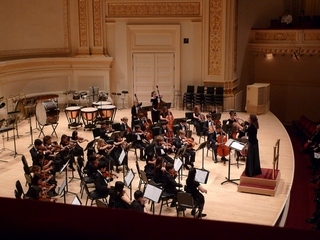 The South Pasadena Children’s Orchestra under the direction of Susan Pascale performed at Carnegie Hall in NYC on April 1, 2009 as part of the World Projects Band and Orchestra Festival. The orchestra was the youngest orchestra ever to perform at the prestigious hall. They won the highest honors, a GOLD rating for their performance. See the children’s performance at Carnegie Hall: http://www.youtube.com/watch?v=ZG-JiBj9PBI. For more information about the program visit www.StringsProgram.com. The South Pasadena City Council heard Caltrans officials Wedneday night explain their current approach to completing the Long Beach Freeway (Interate 710) by constructing a tunnel beneath the city. The officials delivered technical information to the city council. They reported on the “geotechnical” survey underway to determine if the tunnel approach is actually feasible and practical. A rare opportunity to hear and meet a world-renowned concert violinist in an intimate local setting – and to support classical music for youth – is coming on the evening of February 7, 2009 at the Oneonta Church. The New Year will mark the return of an old friend to many in South Pasadena. Mark Jager, former resident and proprietor of an antique shop will be showing his recent paintings at SoPas Gallery of the South Pasadena Chamber of Commerce. Drs. Ellin and Harry Lieberman opened their South Pasadena home to community leaders and supporters on Sunday, Dec. 7 for the 4th Annual South Pasadena Arts Benefit. 15-year-old Ariana Solotoff won the state viola championship at the prestigious California ASTA (American String Teachers Association) State Solo Competition, junior division (through age 18) on October 25, 2008 at UC Davis. The competition brought together the finest young strings players from throughout California. Beginning February 3rd, works by Joan Weinzettle and Melanie Ciccone will be on view at SoPas Gallery of the South Pasadena Chamber of Commerce. The art on view consists of textile quilts as art and mixed media collage inspired by the textile arts. When times get tough, the tough get branded!